A new book co-authored by Brown public policy professor maps out how the status quo trumps science in American health care. PROVIDENCE, R.I. [Brown University] —In 2002, Eric Patashnik, came across a puzzling study in the New England Journal of Medicine, which found that a widely used surgical procedure for osteoarthritis of the knee worked no better than a sham procedure in which a surgeon merely pretended to operate. Assuming that common medical treatments must rest on evidence of their effectiveness, Patashnik and colleagues Alan S. Gerber of Yale University and Conor M. Dowling of the University of Mississippi began to investigate why the procedure had become popular and how doctors responded to the landmark study. Over time, the researchers found that the knee surgery case is illustrative of broader problems in the U.S. health care system and that treatments contradicted by evidence can remain the standard of care for decades. The book draws on public opinion surveys, physician surveys, case studies and political science models to explain how political incentives, doctors and partisanship undermine evidence-based medicine. 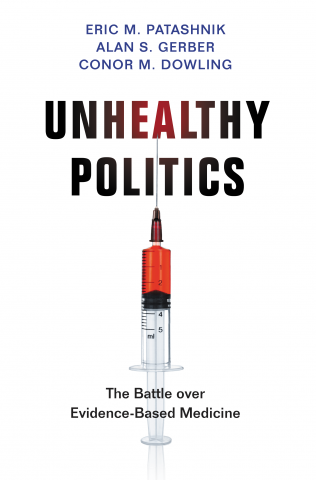 In their new book “Unhealthy Politics: The Battle over Evidence-Based Medicine,” Patashnik and his co-authors look at how partisanship, political polarization and medical authority stymie efforts to promote better, more efficient health care for Americans. Here, three weeks before a roundtable discussion on the book at the Watson Institute, Patashnik — a professor of public policy and political science who oversees Brown's master of public affairs program — shares thoughts on evidence-based medicine and what roles doctors, politicians and patients can and do play in this debate. Q: Was the rest of the medical community as motivated as you were to investigate how an ineffective knee surgery came into common practice? Many orthopedic surgeons and medical societies reacted negatively to the study. Rather than viewing the research as an opportunity to re-evaluate their treatment protocols, they attacked the study on questionable methodological grounds and focused their energy on lobbying the government to maintain coverage of the procedure under the Medicare program. We wondered: “Why did this procedure diffuse into clinical practice in the first place?” After reviewing the medical literature, we found that surgeons became very excited about performing this operation even though there was no hard evidence that suggested it would work. Many of the original studies were not randomized control trials but case studies in which a surgeon would say, essentially, “I performed this procedure on a number of my patients and they felt better.” And that was eye-opening to us. It helped us to understand that there’s a large “medical guesswork” problem. Many treatments do not rest on strong evidence about their clinical superiority to alternatives, and the uptake of the evidence may be slow and haphazard. It can take a long time for the new research to change clinical practice. Q: What is the danger in adopting treatments that are not evidence-based? The failure to ground treatments in sound science lowers the quality of care and contributes to wasteful spending. There have been cases where patients received highly invasive treatments that turned out to work less well than safer alternatives. If we can’t reduce payment for treatments that are clinically useless or, at best, offer low value for money, how will we ever control health care spending? Q: In your book, you note that some experts believe that less than half of medical care in the U.S. is supported by evidence of its effectiveness. Is it clear why this evidence is missing from the equation? Information about the comparative effectiveness of treatments is a public good, and the market won’t provide the socially optimal level of this information without public subsidy. When drug companies apply for Food and Drug Administration (FDA) approval, they generally only have to demonstrate that a drug works better than a placebo. They are typically not required to show that a new drug is superior to alternatives, and it’s often not in the pharmaceutical company’s economic interest to spend the money to assess the product’s effectiveness compared to other therapies. So the FDA approval process is not set up to determine which treatments work best for patients with different conditions. In addition, there’s no FDA for surgery. In many ways, the biggest medical evidence gap concerns not drugs but rather new procedures, which may enter into widespread use without undergoing any rigorous evaluation at all. To its credit, the Obama administration recognized the medical evidence problem and a new nonprofit, independent agency, the Patient-Centered Outcomes Research Institute was established through the Affordable Care Act (ACA) to provide taxpayer funding of comparative effectiveness research. However, this entity has not yet had a major effect on clinical practice. It faces a sunset date of 2019, and it’s not yet clear if it will be reauthorized. Q: Has comparative effectiveness research become politically controversial? The idea of improving the medical evidence base is supported by health policy experts across the spectrum. However, the proposal to increase government funding of comparative effectiveness research got caught up in the ideological and partisan battle over the ACA. As a result, many conservatives who had long been concerned about wasteful spending and the need for a stronger evidence base raised charges of rationing and death panels. Our interviews with Republican congressional staffers suggest that these attacks were largely tactical. They were done as a way to foment public doubt about the federal government’s overall role in the health care sector in an era of intense partisan polarization, rather than out of a belief that the status quo is working well. It remains to be seen whether bipartisan support for needed reforms will re-emerge once the fate over the ACA is completely settled. Q: Do Americans support efforts to make medicine more evidence-based? In a series of public opinion surveys we performed, we found that Americans would like to have better information about the benefits and risks of different treatments. However, Americans are very concerned that payers — insurers and the government — will use information about treatment effectiveness to interfere with the doctor-patient relationship. Americans view health care as a highly personal matter, and they’re worried about any outside group getting between them and their doctor when it comes to the treatments they receive. We performed some survey experiments that showed if doctors were to actively support reforms to improve the way in which evidence guides care, many of the public’s fears would be eased. Q: Have doctors demonstrated an interest in supporting evidence-based medicine reforms? Virtually every doctor believes in the goal of evidence-based medicine, but when a well-done study challenges the effectiveness of a particular treatment, physicians in that practice area often challenge the study and try to preserve their professional autonomy. In recent years, a number of medical societies have supported an initiative called Choosing Wisely to identify low-value treatments. This is a heartening development. Unfortunately, the effort has not yet had much effect on clinical practice. Many of the societies focused on low-impact treatments, rather than on more widely used treatments whose elimination would save a lot of money. Some medical societies have even pointed to the inappropriate use of treatments by other medical societies, rather than taking responsibility for their own practice areas. Since physician leadership is key, we performed a national survey of physicians to see what doctors think about the overall efficiency of the U.S. health care system. Our survey produced three key findings. First, many doctors are not well informed about health services research on waste and geographic variation in U.S. health care, despite the prominent role this research has played in policy debates over the ACA. Second, many doctors want their medical society to play an “attack dog” role when evidence emerges that treatments in their practice areas do not work as well as previously believed. Finally, there are some notable differences in the beliefs of physicians based on their partisan identification. Doctors who identify as Republican view advocating for economic interests and protecting clinical autonomy as somewhat more important priorities for medical societies than do Democrat doctors. Q: Why have politicians been hesitant to take steps to curb wasteful spending and ensure that care is based on sound evidence? Politicians instinctively recognize, quite correctly, that the public trusts doctors much more than they do government. What we found through a series of survey experiments is that if an elected official suggests that a treatment is being overused and if this position is opposed by doctors, then the official will take a reputational hit for challenging the treatment, even if the science is on the politician’s side. The quality and efficiency of our health care system ultimately depends to a great extent on the self-regulation of the medical profession. If doctors fail to uphold their responsibility to avoid unnecessary treatments and wisely manage the allocation of limited clinical resources, there may be no electoral incentive for politicians to intervene.